Hi! 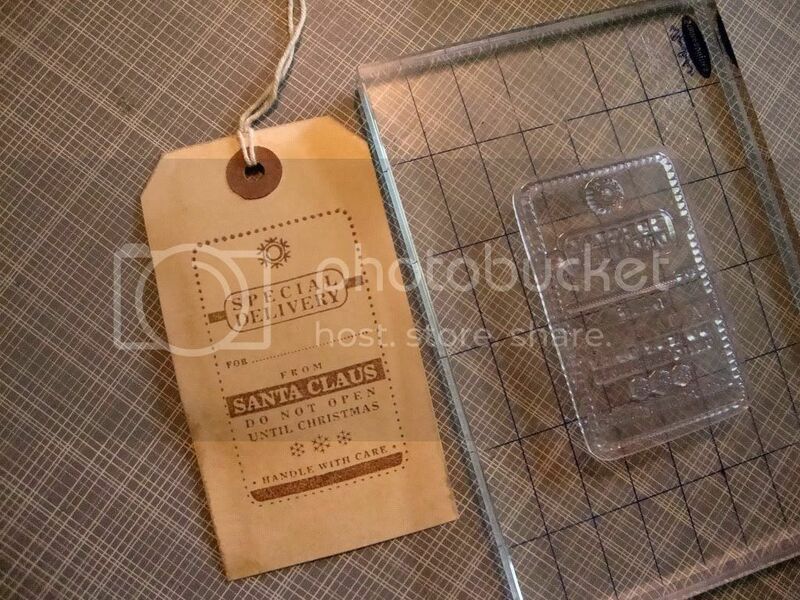 Tracy here and it's my turn again to bring a tutorial for our Kraft Journal readers so I have taken a step by step look at creating a special little holiday tag. For the first step I used a Mini Kraft Merchandise Bag and sliced off the fringy top at at angle. 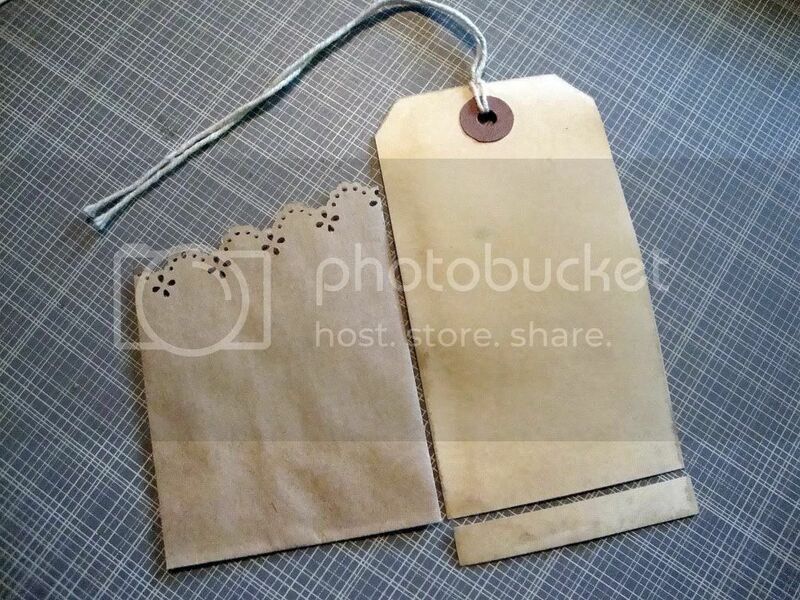 I then used a decorative edge punch along the cut edge to create a cute tag pocket. 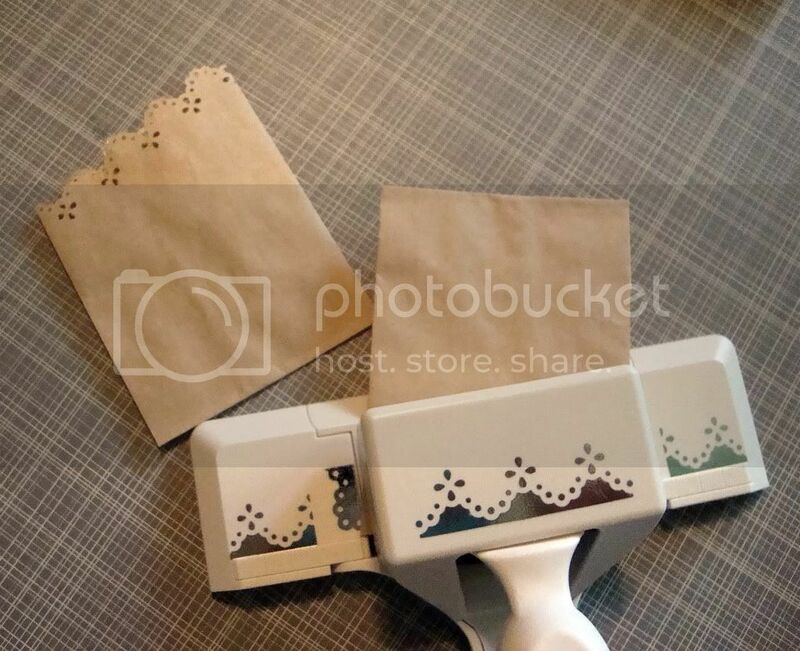 Since the bags are so thin, make sure you really squeeze your punch hard or you might even try adding an extra layer of plain paper to add a little thickness for punching. The large Grungy Prim Tags fit perfectly in these little bags. I trimmed a small amount off of the bottom for my project. 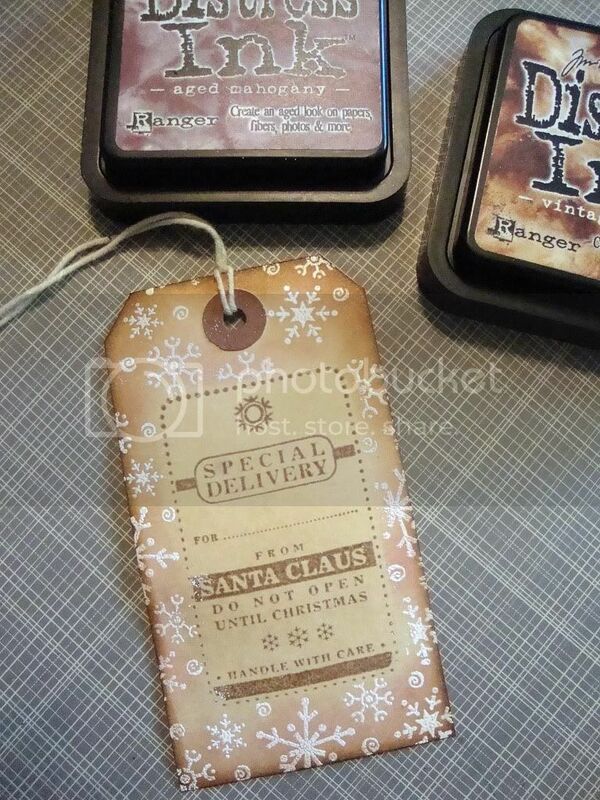 Next I stamped a Christmas tag stamp onto the Grungy Prim Tag with some sepia ink. 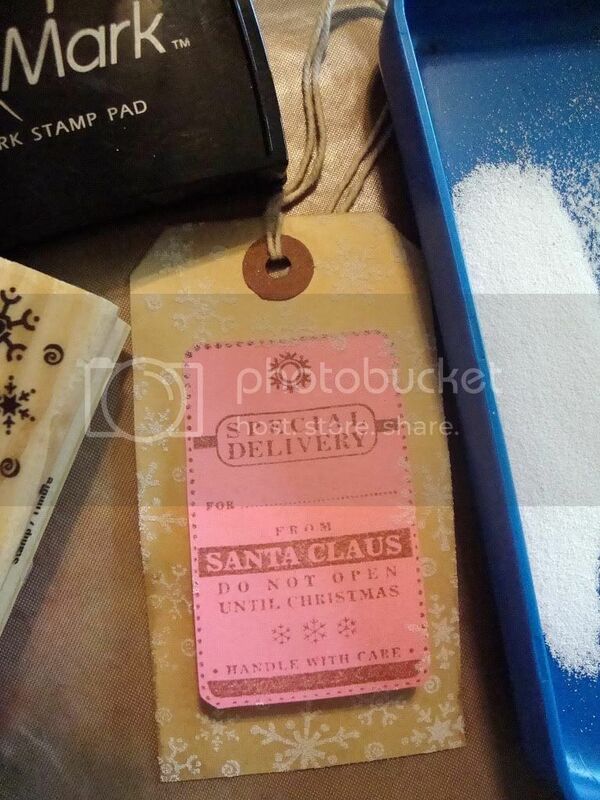 I wanted to dress the tag up a little bit, so I masked off the stamped area and used Versamark and embossing powder to add some snowflakes to the perimeter of the tag. To make the snowflakes pop, I sponged on a little Aged Mahogany Distress ink and then Vintage Photo and wiped the excess ink off of the embossing. 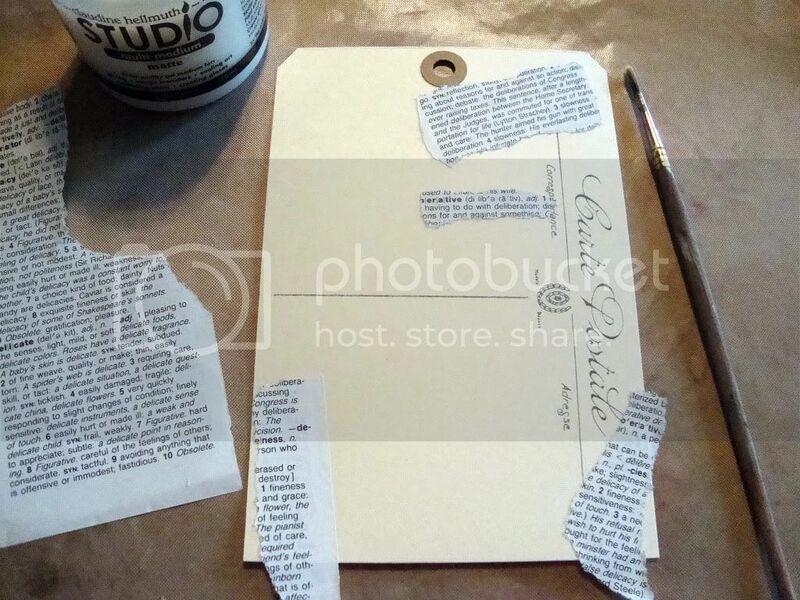 To add some interest to the Buff French "Carte Postale" Postcard Shipping Tag, I used some gel medium to add torn pieces of Vintage Dictionary page to the tag. As you can see, some of the gel medium leaked out from under the Dictionary page, but I really like how it looks. 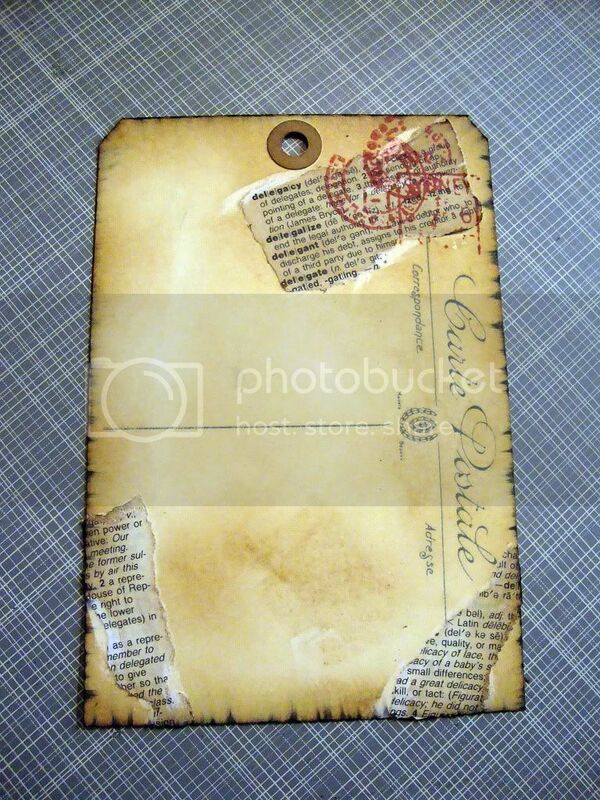 I inked the entire tag with Vintage Photo and then used Black Soot Distress ink to give it a singed look. I stamped a postmark stamp using Fired Brick Distress ink in the corner. Time to put the tag together with all the little extras! First I added the punched pocket and tag. I tied some Red Bakers Twine around the pocket. 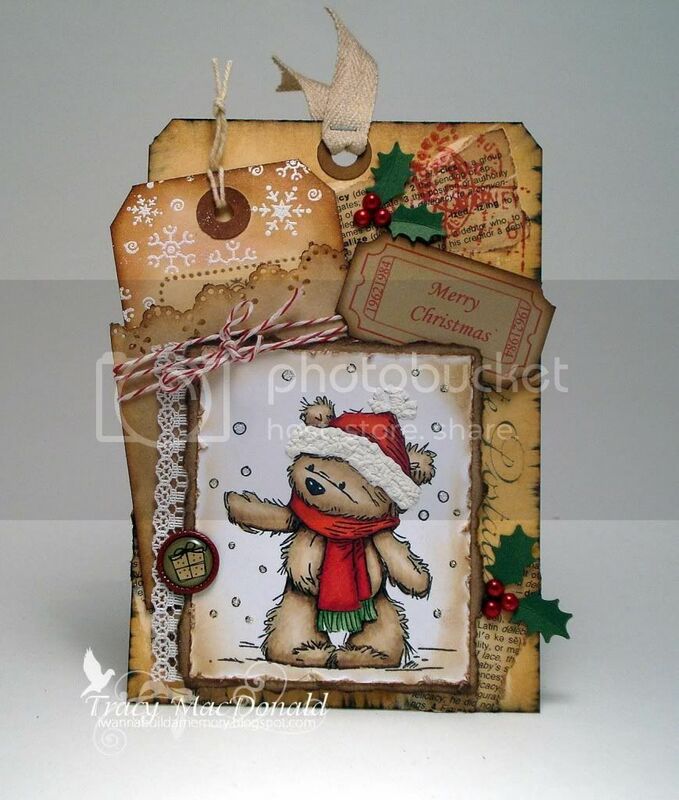 Next came the little bear image that I matted on some Lunch Bag Kraft Cardstock. On it's left, I tucked a little lace under the edge and glued on a Christmas Epoxy Brad which I broke the prongs off of. The ticket was printed on my computer using a digi that my sweet friend Dana has for free on her blog here. I just added the sentiment in Photoshop, printed it out in red onto some Brown Kraft Cover Weight cardstock, trimmed it, and used a ticket corner punch on the ends. I added a piece of Twill Tying Tape through the postcard tag hole and last but not least, some punched holly leaves complete with berry pearls that I colored with a Copic marker to match. All the pieces were edged with Vintage Photo and Walnut Distress Stain inks. Hope you found something to try in the tutorial. Have a great week and don't forget there is still time to join our "Christmas in July" challenge. You can learn more about it and link your project too by clicking on our Current Challenge link that is located in the upper right corner of our sidebar. Adorable and so creatively made! adorable! love all the different techniques used. This is stunning, Tracy!! Wowzers! This is amazing, Tracy!! Such a fabulous project and great inspiration to use those postcards!! Well done!